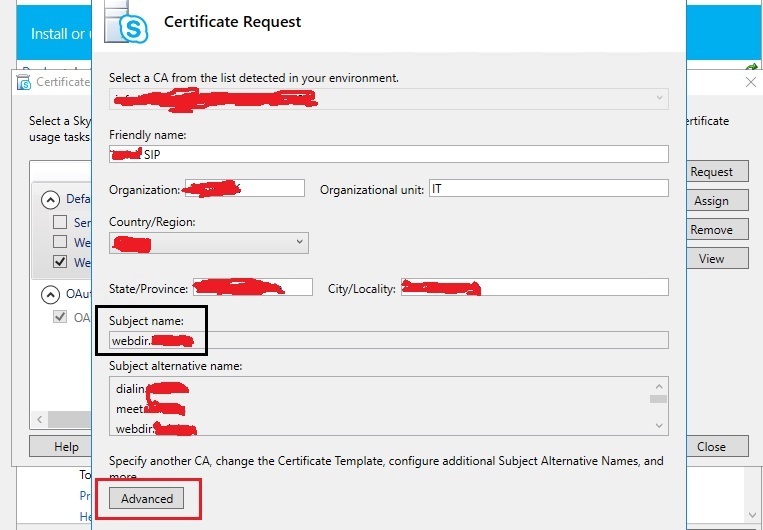 I need little help with renewing 3rd party certificate on Skype for Business 2015 server. As per pictures attached, i want to renew only that certificate (SIP, since it is 3rd party and all others are from internal CA), and when i go to Request with Advanced option, and populate everything i end up with csr, that has a common name of webdir.<domain>.com, in stead of sip.<domain>.com (as it is atm). So, the question is how to renew this certificate but to have CN of sip.<domain>.com, when there is no option to define CN? Can I use maybe exchange server, generate CSR there, then just delete it after i get new cert, or something like that? -->Can I use maybe exchange server, generate CSR there, then just delete it after i get new cert, or something like that? Create a CSR and install certificate in Exchange server and export with private key. Set-CsCertificate -Type WebServicesExternal -Thumbprint "B142918E463981A76503828BB1278391B716280987B"
will try tomorrow, and let you know how it went.